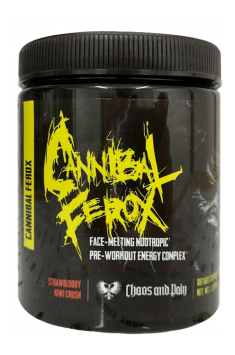 Chaos & Pain Canibal Ferox is an advanced pre-workout which is effective in stimulating the body and boosting levels of motivation and concentration. The formulation boosts the production of nitric oxide, thereby causing the muscle pump, and encourages the breakdown of fatty acids. The supplement regulates the levels of neurotransmitters and the function of the sympathetic nervous system, consequently reducing fatigue and giving a quick surge of energy. Citrulline malate – a combination of a non-proteinogenic amino acid with malic acid which widens the lumen of blood vessels and thus causes the muscle pump. Citrulline is a precursor of arginine which stimulates the synthesis of nitric oxide. Easier blood flow to the muscles increases their supply of oxygen and nutrients, which positively influences the body’s performance. Beta-alanine – a combination of two amino acids (alanine and histidine) which convert in the body into carnosine. Carnosine is found in high concentrations in skeletal muscles where it regulates ph levels. It is therefore an acceptor of hydrogen ions which are produced due to insufficient oxygen supply and produce a burning sensation in the muscles. Beta-alanine supplementation helps maintain high-intensity exercise for longer and delay the inset of muscle matigue. Creatine monohydrate – the most popular ergogenic supplement which beneficially influences the body’s performance in any kind of sport. Creatine provides muscles with a phosphate group, used for the resynthesis of adenosine triphosphate (ATP), i.e. an energy carrier. Because of that, the body produces energy more effectively and this consequently increases strength and power output and delays fatigue. N-Acetyl-L-Tyrosine (NALT) – an amino acid which is has an extra acetyl group and is thus effective in crossing the blood-brain barrier. In the brain, it is a substrate for the production of catecholamines (dopamine, adrenaline and noradrenaline). Its intake enhances the production of dopamine which is a neurotransmitter responsible for motivation, concentration and motor skills. NALT significantly improves motivation for pursuing training goals and boosts neurotransmitter production while taking stimulants. Caffeine anhydrous – stimulates the body into producing adrenaline and noradrenaline which increase energy levels and the body’s metabolic rate. Since it resembles adenosine, caffeine can binds to its receptors, consequently reducing fatigue levels. Caffeine supplementation causes a significant increase in energy levels and performance during high intensity exercise and beneficially influences the process of body fat reduction. Orchilean – an extract of the plant Cymbidium Goeringii with strong stimulant effects. It is reported to be a much stronger stimulant than DMAA. What is more, it boosts NO levels and thus helps improve the body’s endurance and performance. In addition, Orchilean has antioxidant effects and therefore helps remove free radicals produced during physical activity. Isopropylnorsynephrine – a derivative of synephrine which is more bioactive, but it does not have negative effects on cardiovascular function. It activates β3-adrenergic receptors in adipose tissue, mobilising energy stored in adipocytes. Its intake speeds up metabolism and beneficially influences body fat reduction, especially in so-called stubborn areas. Halostachine – a natural alkaloid with stimulant effects. The compound is a derivative of phenethylamine (PEA). Halostachine has similar effects to ephedrine. Nonetheless, it is safer and targeted at producing energy and inducing lipolysis and the release of neurotransmitters responsible for a good mood and concentration. It exerts strong lipolytic effects and improves motivation levels and mental clarity. Hordenine – a plant alkaloid which acts on the central nervous system. It blocks the activity of monoamine oxidase B (MAOB), responsible for the breakdown of catecholamines. Hordenine prolongs the effects of neurotransmitters, thereby enhancing concentration and cognitive functions. Yohimbine and alpha-yohimbine (rauwolscine) – yohimbine is a natural plant alkaloid which blocks α2-adrenergic receptors, thereby stimulating the release of catecholamines via a negative feedback mechanism. As a consequence, this encourages lipolysis, especially in stubborn areas, including the abdomen, thighs and buttocks. Rauwolscine is in turn a form of yohimbine with a greater biological activity. Because of that, it is called alpha-yohimbine. Its mechanism of action is similar to its counterpart. However, it does overstimulate the cardiovascular system, i.e. it doesn’t increase your heart rate and blood pressure. Huperzine A – a plant alkaloid which is an inhibitor of acetylcholinesterase, i.e. an enzyme responsible for the breakdown of acetylcholine (ACh). ACh is a neurotransmitter involved the contraction of skeletal muscles and has also a major role in learning and memory. Taking huperzine A enhances cognitive functions and focus and has neuroprotective effects. To sum up, Chaos & Pain Canibal Ferox is an advanced pre-workout stack which enhances the body’s physical performance. Stimulants have synergistic effects on the levels of neurotransmitters and catecholamines, thereby effectively stimulating the body and helping you perform at full capacity. The supplement is aimed at reducing fatigue, improving mental and physical functions, boosting motivation and stimulating lipolytic processes. One portion (1 scoop) half an hour before workout, preferably on an empty stomach. Mix 1/4 to 1 scoop of Ferox into liquid to get crazy. Never exceed 1 scoop or take close to bedtime. it's a very powerful pre-workout supplement containing high doses of stimulant and should not be used later than 5 hours before bedtime. In order to see the body's tolerance to the product, it's recommended to use only half of the portion when using it for the first time. The next time it's used, based on the experiences and tolerability, the dose can increase or decrease. In case of pre-workouts, an appropriate dose is crucial. Portions that are too large may even result in the inability to continue a workout. it's not recommended to take more than 1 portion a day.